What are some of the biggest changes that Berube has made since taking over from Yeo? Any chance that the Blues will play in another outdoor game anytime soon? If you're the owner of the new Seattle franchise, what do you name the team? What colors do you choose? and what mascot? It's pretty obvious. They've become a more physical team. Lots more hits. Lots more mini-scuffles. More fights. And he's wanted them to play a harder game. For the first several games, he was doing much less line-changing which the players liked. But as you see from tonight's lines, he's going all-out with new lines against the Oilers. Here's a story I did on the topic after a few games of the Chief. stltoday.comTeam's interim coach has an edge to him, and he wants Blues to play with an edge. OK sorry, I've managed to mix up the order on these questions. This answer goes to the question about biggest changes under Berube. Here's the answer to question about outdoor game. I think next up for the Blues will be hosting the all-star game. So I'd say no on another outdoor game any time soon. And the answer about the Seattle nickname/mascot. I like the Seattle Totems (if that's deemed politically correct). It was the nickname of Seattle's Pacific Coast League team for many years. The Bluebacks (a kind of Salmon), the Cascades (Rainiers is taken by Tacoma AAA baseball team). You could have a tall skinny mascot for Totems. A walking fish, maybe on a hook or a plate for Bluebacks, and someone dressed liked a snowcapped mountain for Cascades. Is there any chance of the Rams bringing Tony Horne back to return kicks? Sorry, wrong decade, wrong chat. Boy Tony could sure bring it. And yeah, it's been nearly 20 years. Are there any investors out there currently looking to buy an existing franchise and move them to their city? The NHL is now happy with 32 teams. Given Parayko’s clear regression do you think the Blues jump the gun in regards to the contract he was given? Obviously, I wasn't around to see him regularly until last season, but I don't think he's played badly at all this season. Yeah, he had a couple of glaring, costly turnovers _ like the Montreal game _ but he's a team-high plus-6. Seems to be one of the only defensemen (other than Dunn) willing to skate out of the zone with any degree of regularity. And he did win a game in dramatic fashion in Colorado. And yes, I'd like to see him be even more physical. The Blues have enough individual talent that if they decided to tear it down all the way, they could acquire the high end talent to finally win the cup. Is there any thought of that? I'm sure there will be changes unless something radically changes. I don't think we're looking at a total tear down though. The games between Colorado and Pittsburgh and Toronto and Buffalo were amazing to watch. Same for Vegas and Washington. Blues seem way far off and out of this league. Well if you could tell me the Blues team that played against Vegas (twice), in Toronto, at home against San Jose or last Friday in Colorado _ well, yeah _ I'd say put them in a Winter Classic type game. But what if the Blues vs. Arizona crew should up instead? With Petro up at the end of next season and the blues not looking like contenders for the next year and a half, at what point would you start looking to trade him? I think he’s been an outstanding player and this doesn’t have much to do with his play. But he will command a Doughty like contract and we see how bad that one will be. It’s more about the next contract and where the blues appear to be headed as a team. I think he'd draw some sincere interest. And just me, I wouldn't be against it if the return was right. Is it just me, or are the Blues fairly undersized up front? Blais, Fabbri, and Perron all seem to be way too easy to move off the puck. Yeah, at least a little undersized. But Schwartz is one of the smallest guys on the team, and he doesn't seem to have any problems with that. OK, give me about 3 minutes to get some chips and a soda from the Post-Dispatch vending machines. . . ..
. . . .Ruffles cheddar & sour cream chips, Diet Coke. We now return to our regularly-scheduled programming. Speaking of expansion, will KC ever see a team? Can't see it now that the league is at 32. I think he was under consideration for this call-up. Apparently he's playing a pretty physical style and has scored a bit. He's still only 19, I think the Blues want him to get even more experience in the AHL. But I'm sure he's on their radar for future call-up. JT, I'm astounded at how horrible the Blues are at judging goaltending. I can't remember the last time the Blues have had an elite goaltender. CuJo maybe??? Obviously, it's been an issue. Allen has been on a good run lately. And I actually felt sorry for Johnson the other night. He was like a target in a video game. Sure maybe he could've stopped a couple of pucks, but he was totally hung out to dry by his defense _ and I men forward and D-men. Cujo's in town by the way. I think he's signing books Thursday at Barnes & Noble in St. Peters at 6:30 p.m.
Do you think you'll be asked to cover the new XFL team for the paper? I could see myself doing a story here and there, but I'm a hockey guy now _ and enjoying it. Did you see the Reaves hit on Tom Wilson last night? How ironic the Caps are crying about it being a "blind side" hit. They should know, I guess, because that's the kind of hit Wilson specializes in. Poor Tom got a little taste of his own medicine, except it wasn't a head shot. Good for Reaves. I wonder how many players in the league liked it as well. I would guess there was a favorable reaction around the league. No matter how tough you think you are, there's always a bigger bully on the block somewhere. It has looked to me the NHL has had a standing grudge against the Blues ever since we blew up free agency back in ‘91 and ‘92 by signing Scott Stevens and Brendan Shanahan. 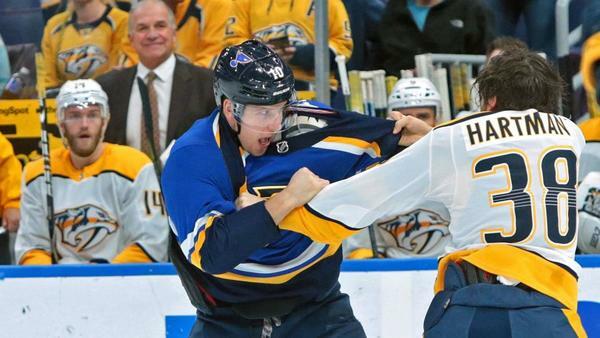 The latest is no action against Erik Johnson on the blatant elbow to Steen. I don't know about all that. Even Armstrong said Monday he didn't think it was overly-blatant. With all the injuries we will now be able to see what our kids can do. The knock I had against Yeo was he would always play the veterans over the younger players. The NHL is a young league now. It certainly is right now. And I couldn't agree more. Time for the youngsters to show what they can do. Against Arizona, in Sammy Blais, Zach Sanford, Robby Fabbri (before injury), Robert Thomas, Vince Dunn, Jordan Schmaltz, Ivan Barbabshev, Oskar Sundqvist _ the Blues had 8 players who were between the ages of 19 and 24 _ or maybe Schmaltz turned 25 earlier this season. That group of 8 had between 20 games and 138 games of NHL experience. It's show-time for them. Could be a good fit on the fourth line, and he's certainly not afraid to mix it up physically. So I was at that Avs/Blues game last Friday and had a blast. One question though -- why didn't Erik Johnson receive any supplementary discipline for knocking Steen senseless? He clearly elbowed him in the head and Steen suffered an injury as a result. What gives? I know I'm still relative new to all this, but the consistency in terms of officiating in the NHL befuddles me. (And this, yes, coming from a guy who's seen the many ways the NFL does _ and doesn't _ enforce pass interference/defensive holding _ for more than a quarter of a century. I thought Johnson led with his elbow.